Pro-Flex XC has been developed to comfortably support the active user who enjoys hiking and jogging, as well as level-ground walking. Pro-Flex XC Torsion combines the Pro-Flex XC features of energy return and smooth roll-over, with valuable shock absorption and rotational capabilities. The sole blade offers a effective full-length toe, and a wider foot blade than traditional feet. 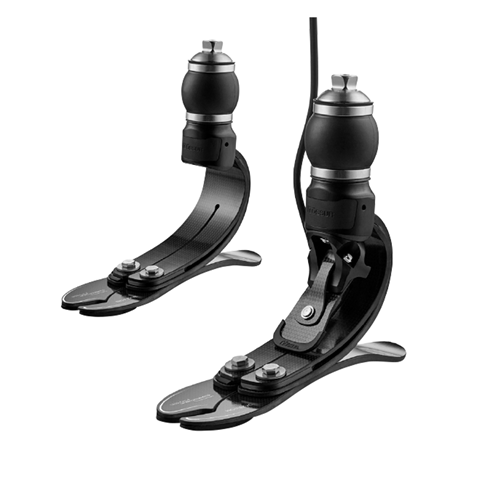 The foot is ideal for active users who want to use a single, lightweight foot for their normal daily life, as well as a range of higher impact activities. Less load and more dynamics means that amputees can enjoy greater comfort in a wide range of activities. The well-designed and lightweight anatomical foot cover features a steady-grip sole for barefoot stability on wet or slick surfaces, and a sandal-clamping toe for a range of footwear including flip flops. Össur recommends using Pro-Flex XC Torsion together with the Unity sleeveless vacuum suspension system. This adds minimal weight, no extra build height, and does not interfere with the Pro-Flex XC Torsion dynamics. Unity is designed to provide secure suspension in combination with Iceross Seal-In® technology, while stabilizing volume fluctuations and maintaining comfortable socket fit throughout the day.